Today’s Texplainer question was inspired by reader Jaime Villarreal. 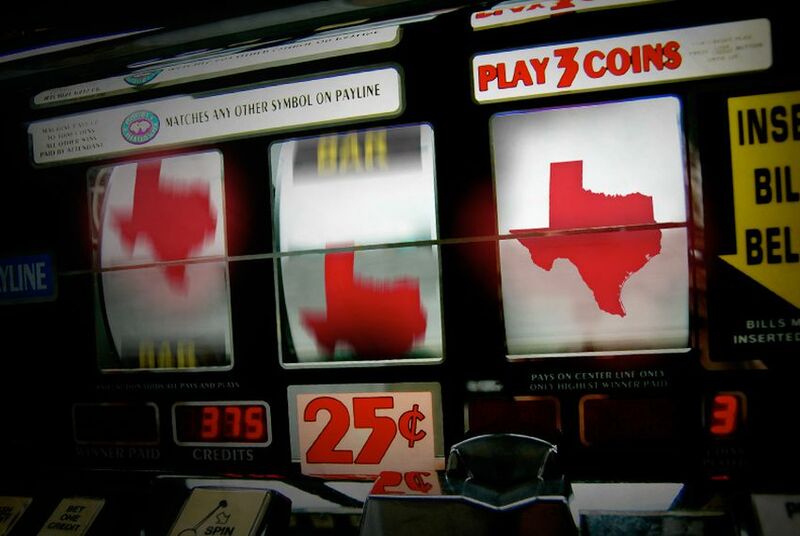 Hey, Texplainer: Why do I have to go to other states to gamble? When Texans want to spin a roulette wheel, pull the arm of a slot machine or try their hand at scooping up the pot in the center of a poker table, many pack their bags and head for Louisiana, Oklahoma or Las Vegas. That’s because in most cases, it’s illegal in the state to gamble. For the past several decades, Texas legislators have largely frowned on the idea of relaxing the state’s gambling laws out of concern for morals and negative social effects. But Texas’ gambling laws aren’t by any means the strictest in the nation, and there are some forms of legal gambling that do take place. Texans may buy lottery tickets or place bets on horse races and greyhound dog races. The state’s also more lax on “social gambling,” or gambling that takes place in private places. Bingo games or charity auctions are usually allowed, so long as the organizer doesn’t take any portion of the profit. Some of the three federally recognized Native American tribes in the state can own and run casinos on their lands. Right now, there are two casinos operating on reservations located near Livingston and Eagle Pass. The Kickapoo Lucky Eagle Casino near Eagle Pass is a fully functioning casino, complete with a poker room and gaming machines. It’s as close as Texans can get to Las Vegas-style casinos without leaving the state. Meanwhile, Naskila Gaming, a casino-like facility near Livingston, is the focus of an ongoing legal battle between the state and the Alabama-Coushatta Tribe. Texas Attorney General Ken Paxton says the facility is subject to state laws. The tribe says it has federal authority to allow certain kinds of gambling. Right now, the venue is operating, but the state is trying to shut it down. There are also new forms of gambling-oriented businesses popping up throughout the state, such as the Post Oak Poker Club in Houston. Texas law maintains that an “organizer” can't take money from the pot in games of chance. Instead, the poker club charges patrons a series of rental fees. Poker clubs like the one in Houston are in a legal gray zone, according to Greg Gladden, a lawyer who practices gambling law in Houston. He said the gaming laws aren’t clearly written and are enforced in different ways throughout the state. For years there has been a debate over whether the state should expand, clarify or get rid of its gaming laws. Some Texas legislators, such as state Rep. Carol Alvarado, D-Houston, say it’s time to leave some gaming laws up to the voters. She filed a bill in 2011 with the intent to do just that. Letting voters decide might lead to destination casino gambling – or casinos like those in Louisiana that have hotels – being legalized, she said. In 2011, a University of Texas/Texas Tribune poll found 56 percent of Texans supported allowing full casino gambling in the state. Alvarado said she thinks a law that allows for destination-type casinos would cut down on the amount of illegal gambling and could help generate additional revenue. She said she’ll file a similar bill in the next legislative session. “I’m going to continue to propose it until we pass it,” Alvarado said. Meanwhile, the U.S. Supreme Court could rule as soon as Tuesday on whether individual states should have the right to decide whether they want to allow gambling on sports. Right now, legal sports gambling is essentially confined to Nevada. But even if the Supreme Court opens the option to other states, Texas might not jump at the chance to legalize the practice. In 2015, Gov. Greg Abbott, a Republican, told the Texas Lottery Commission that he "wholeheartedly" supports the current state restrictions on gambling. The bottom line: Texas gambling laws are complex, but Texans don’t necessarily have to leave the state in order to gamble.